As the political season begins to heat up for 2020, we have seen an increasing number of proposals to provide free education, free healthcare, a universal guarantee of a living wage, etc. With an historic level of public debt topping $21 trillion and a deficit of nearly $1 trillion and projected to climb even more in 2019, the logical question is how will the advocates for all those free programs pay for their suggestions, some of which have been priced out in the neighborhood of $30 trillion? The almost universal response is to raise tax rates on the wealthy so that they can “pay their fair share.” Let’s look at some facts. First, who is paying what? 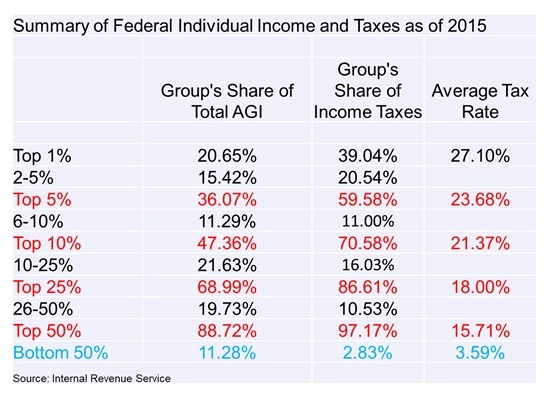 The following table is from the most recently available data from the IRS for 2015, showing federal individual shares of adjusted gross income, share of taxes paid, and average tax rates by income class. The top 1% had 20.65% of AGI and paid nearly 40% of the taxes. Similarly, the top 25% earned just under 70% of the income and paid 86% of the taxes. By comparison, the bottom 50% of the income distribution earned only 11% of the income and paid 2.8% of the taxes. Data reflecting tax structure changes taking effect for 2018 is, of course, not yet available. The argument is that it is necessary to raise the marginal tax rates on the higher-income groups so that they can pay their “fair share.” But what is a “fair share” and who gets to decide what is “fair?” Clearly, those already bearing the bulk of the tax burden are going to argue that they already are paying more than their “fair share,” while those with pet projects they want to fund will argue to increase the tax burden on the rich. Further, would raising the marginal tax rate on the wealthy actually generate the river of additional revenue the “70 percenters” envision? Just how realistic are the proposals to raise the highest marginal tax rates to 70% or more? Historical evidence suggests that such proposals are, at best, naïve, and will not succeed. Proponents simply assume, without any understanding of history or how taxes affect behavior, that their proposals will be the magic solution. It turns out that the US has a rich history and multiple experiments with widely varying marginal tax rates, dating back to the Great Depression. The highest marginal personal tax rate at one time was 94% in 1944, was about 91% from 1954–1963, dropped to about 70% from 1964–1980 before declining to its present rate in 1993. The highest marginal corporate tax rate was 52% in 1952 through 1963, and was only a bit higher at 54% between 1968 and 1969. (It will be 21% for 2018.) 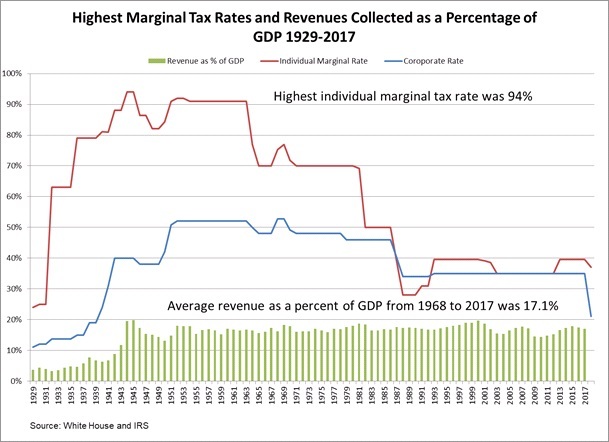 The following chart details that history, but more importantly shows the impact the variation in the highest marginal tax rates has had on tax revenues collected. Over the entire post-war history from 1944 to the present, revenues collected from all sources (including person and corporate income taxes, social insurance taxes, excise taxes and other taxes) have ranged between 14.4% and 19.6% of GDP, with an average of 17.1% and a standard deviation of about 1 percentage point. Thus, variations in the marginal tax rates have no perceptible impact on the volume of taxes collected relative to GDP. The graph of revenues collected is essentially a flat line when compared to the changes in the higher marginal tax rates and changes in the corporate tax rate. It is such a chart that in the past has led many to argue for a flat tax rather than a graduated progressive tax.